The average payback time for a standard-sized solar installation (5kW) is about 5 years. NYC energy rates are higher then the national average at 18.6 cents/kWh. If you installed a 5kW system you would save approx. $1088 per year on your electricity bill ($91/month). The state of New York offers an outstanding solar rebate package to help offset the initial installation costs. A rebate of $1750 is provided per 1kW of energy generated. And the maximum rebate per household is the lowest of either 40% of the equipment/installation costs or $12500. Also, a qualified installer is often able to deduct this figure from the installation fee rather then having to wait for a check in the mail. An excellent tax credit is also available in the state of New York, which is the lowest of either 25% of the installation fees or $5,000. By combining the state rebate listed above and the tax credit here you have the potential to save a mind-blowing 65% or $17500 of total costs of a solar installation. The state of New York offers a full 100% tax exemption on property taxes resulting from the increased value achieved by installing roof top solar panels. Solar systems add an estimated 20 times the annual savings of your electricity bills to a household’s value. What’s more, the costs of PV equipment and installation fees for solar energy systems are also given a full 100% tax exemption from local or state taxes. The Renewable Portfolio Standard (RPS) in the state of New York is pretty good, although at a level that isn’t quite as ambitious as some other states. 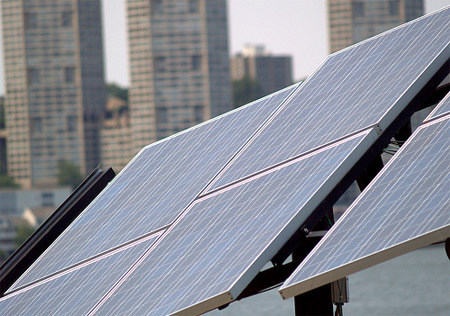 New York is aiming for 22.5% of its energy from renewal sources by 2020. Whereas, in the state of California this target is set at 33% by the year 2020, so if New York wishes to be at the forefront of green energy, it will need to come up with a bit more. The states RPS mandate requires at least 2% of its renewable energy to come from solar. Net metering is available in New York City, which means that for any surplus energy produced which goes unused; you will receive a credit on the next month’s bill. If still holding excess energy at the end of the annual bill cycle, a refund in the form of a check is issued. NYC does imposes a 1% capacity limit on its net-metering, so effectively this incentive is offered on a first-come, first-served basis; the earlier you join, the easier it will be to benefit here.